Remote training collars are effective, safe and humane training tools. The present day technology of remote dog training collars enable users to use low levels of stimulation that are the “just right setting” to get the dog’s attention. It can be compared to tapping a person on the shoulder to get their attention. It can also be compared to the feel of a TENS Unit (Trancutaneous Electrical Nerve Stimulation). Wikipedia describes a TENS Unit as “a non-invasive, safe nerve stimulation intended to reduce pain, both acute and chronic.” Years ago, I suffered a shoulder separation during a Judo practice. Another black belt and myself were practicing our throws and take downs. Due to our competitive nature, it really wasn’t a practice but instead a sparring match. Well ok, truth be known we were screwing around as neither one of us was willing to submit to the other one which one should do to avoid an injury. So long story short, he had me in a one arm shoulder throw and instead of taking the fall safely like I was trained to do, I tried to avoid taking the fall. I didn’t want to be pinned to the mat even though he was an experienced international competitor. Consequently, my shoulder was driven straight into the mat and separated. As part of my recovery, the physical therapist placed a TENS Unit on my shoulder which relieved the pain. It was not painful and instead I would describe the sensation as a stimulating massage. Robin MacFarlane, a professional dog trainer and owner of That’s My Dog, Inc. has created a website entitled “The Truth About Shock Collars”. Her goal is to provide an educational resource on the web to dispel the commonly held negative myths about remote training collars. To this, I salute her! MacFarlane’s new website contains some helpful and thought provoking articles such as: “What Does Science Have to Say about Remote Collar Training?”, “What Level of Stimulation is Needed When Training a Dog with an Electronic Collar?”, “Can I Use a Shock Collar on a Small Dog?”, various testimonials from remote collar clients, and more. 1. Will it hurt my dog? Answer: No. A remote training collar used at the “just right level” will get your dog’s attention and serve as a reminder to comply with your direction. This could be life saving such as when calling your dog away from a passing car, calling your dog off from chasing the family cat or simply just improving your relationship with your dog. The collar does not burn the dog’s skin nor cause any other type of injury. Additionally, some of Michael’s clients include veterinarians who have used and endorsed the use of remote training collars with their personal family dogs and clients’ dogs. We would not endorse the use of a training tool if it was inhumane. 2. Is it like a electronic fence collar? Answer: No. An electronic fence collar system is developed with a shocking intensity necessary to ensure a dog does not go through a permanent boundary. Additionally, it is used as a “positive punisher” which means a punisher is “added” to a scenario (leash corrections, electronic fence, etc.) causing the undesired behavior (going past the boundary) to decrease. Whereas, a remote training collar is used at “just the right” level that gets the dog’s attention. Properly taught, the remote training collar is a “negative reinforcer” which means an adverse stimulus is taken away or stopped (the buzz of the vibration collar or the tingling sensation of the electronic collar) upon the dog complying with the desired command. This results in establishing an effective communication system with the dog instead of a punishing situation. 3. Can I still use food treats, verbal praise and/or physical praise with remote collar training? Answer: Yes. Combining the remote training collar along with positive reinforcement (a desired reward is given to the dog upon successful completion of a desired behavior) and negative punishment (taking a desired reward away until the dog does what you want such as placing his rear on the ground after being asked to “sit”) provides reliability to your training program. The dog does what you want him to do in hopes of receiving a reward as well as to avoid feeling the tingling sensation. 4. Is there a potential for the collar to be used abusively? Answer: Not any more so than any other training tool. It’s a tool, that’s it. Some people who oppose using a remote collar instead resort to yelling at their dog, jerking their dog’s collar, and in some cases even swatting their rear end. A remote training collar is not only not painful but it also removes you from being the bad guy in the scenario delivering the corrective action. Consequently, there is no need for you to become angry with your dog when he does not comply with your directions. It’s nothing personal, it’s just a training issue. 5. Can a novice dog trainer learn to use a remote collar effectively and safely? Answer: Yes, although I didn’t use to think so. As a young trainer, I bought into the idea that a remote training collar should only be used by training professionals or serious dog competitors. The belief presented to me was that the novice dog trainer would not take the time or concern to learn how to use a remote training collar correctly. As my experience as a dog and people trainer increased, I realized this simply is not true. Family dog owners are intelligent people who are concerned for the welfare of their pet. While they do not have the professional experience and knowledge of training dogs, they are intelligent people in other fields. Therefore, they are very trainable. They are seeking professional instruction as how to train their dog the right way, the first time and to do it humanely. So they have already demonstrated their love and commitment for their dog. It is my job therefore, to provide them with professional training that will enable them to be successful with their dog. 6. Can an older person learn to use a remote training collar? Answer: Yes, many of my remote training clients are senior citizens, including my mother who is 73 years of age and recently learned how to train her high energy Miniature Schnauzer using a remote training collar. Some senior citizens may have physical limitations preventing them from being able to handle a strong willed dog but with a remote collar this is not an issue. In fact, a remote training collar is a very effective training tool for many senior citizens to use. So why would one want to consider using a remote training collar? It is because they need reliability in their training program that most family owners cannot achieve without the constant use of food treats or other rewards. It needs to be a system in which is fair and humane to the dog and easy to learn with the assistance of a professional dog trainer. Remote training results in excellent communication and more freedom for your dog. Click here to see a happy working Abby, Golden Retriever, go from pulling on a leash and circling owner to walking on a loose leash in just five minutes of remote collar training. 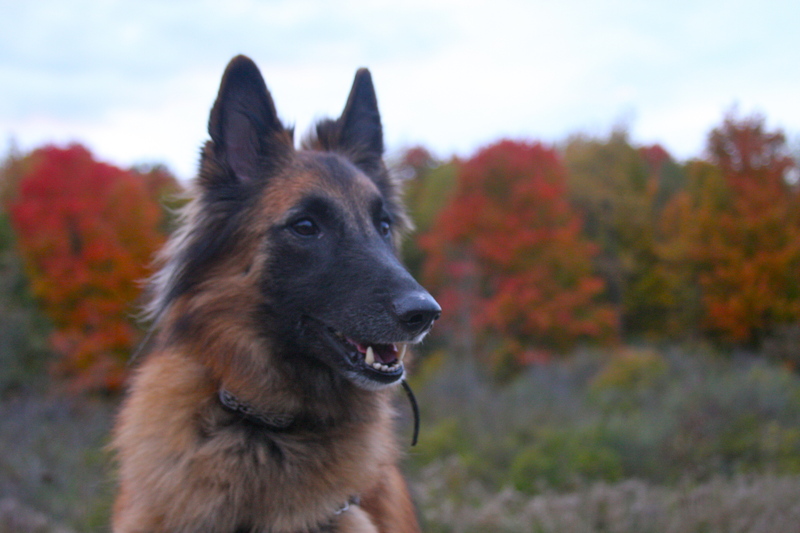 This entry was posted in Remote Training Collar and tagged Belgian Tervuren, FAQ, Golden Retriever, remote collar training, shock collar. Bookmark the permalink.